Coming back to my mom's fish curry, I had no clue how to do and amma was not reachable too. Hmmm so something seafood would satisfy I hoped and ended up doing this simple coconut seafood curry which is another hit at home. 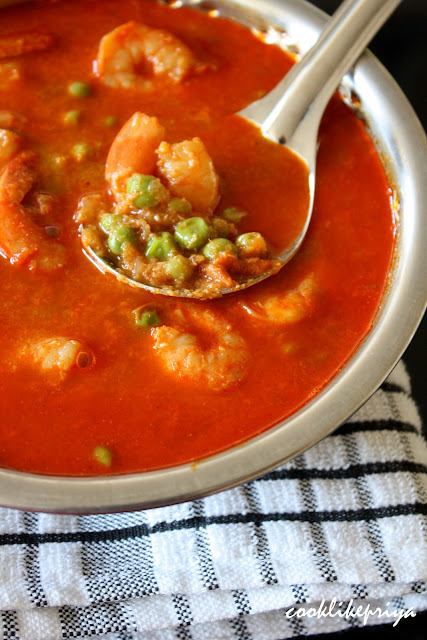 This is a simple coconut based curry that is light and not to overpowering the peas and prawns balance well and it is medium spice, the kashmiri rec chilli powder give this curry its gorgeous color. Needless to say husband loves this, I add a bit of peas just to make it looks a little healthy :P but its totally up to you. You could even use beans or potatoes it would still taste equally great. To this add the masala powders - red chilli, kashmiri red chilli and coriander powder, mix well and add 1/2 cup water and let it cook until oil releases. 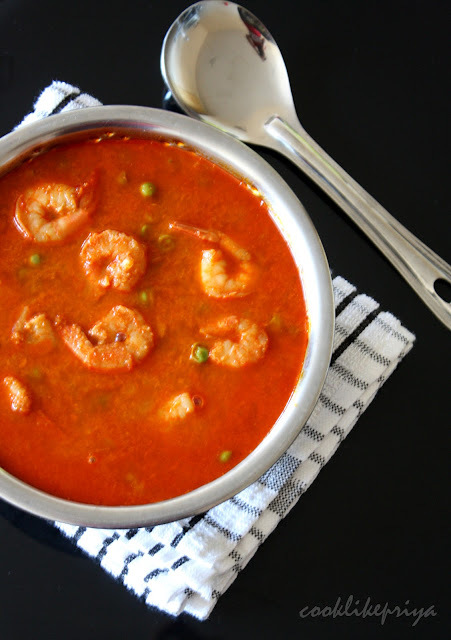 It would take 3-4 minutes and to this add the prawns and peas and coat it well with the masala on the pan. 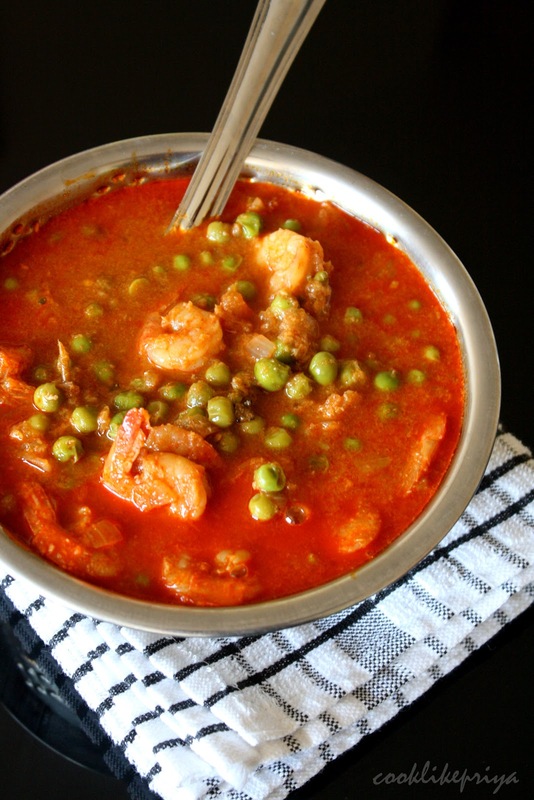 Yummy and flavorful curry.. Peas makes a nice and interesting combination.. Delicious curry Priya. My hubby makes brococoli sambhar when he was staying alone. So weird combos sometime taste great. Love the addition of peas,the gravy looks so yum,spicy and delicious,drool..
OH! What a colour! Delicious. What a delicious soup! So warming, comforting, wonderfully spicy and tasty. Wat a colourful curry,seriously catchy.. A real feast for sea food lovers like me,especially prawns just love it. I’m loving that you are currently producing a local guide for me. I’m hoping there are more recipe to come! 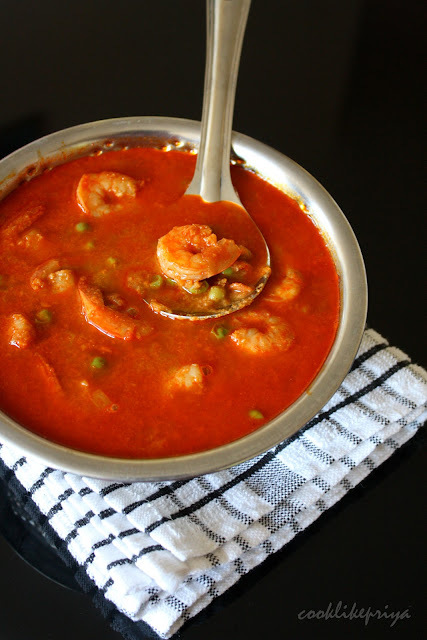 Love the coconut and prawn combo...tempting curry.